Def Leppard guitarist Phil Collen has again commented on the band's plans for 2014 recording and touring. 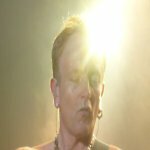 Phil talked to Chuck Hester as part of the 45minute Linked Conversations podcast and discussed Def Leppard's 2014 plans. "But also we start recording new material in February. I'm actually going over to Dublin, Ireland where Joe Elliott lives and we're actually gonna get in and do some new music which we haven't done for a while so this is gonna be a lot of fun." "Not at all and we're not even sure whether it's gonna be an album. We're notoriously really slow at recording. We kind of move at a snails pace. So it may just be the odd song, Obviously we'd love it if we could get an album at least started. But it wouldn't be ready for another year anyway so." "We're probably gonna tour this year and the record would come out some time next year. Like I said unless we have a song that's on a sound track or an E.P. or something like that that we do beforehand. So yeah we got lots of kind of ways we can go with that actually."